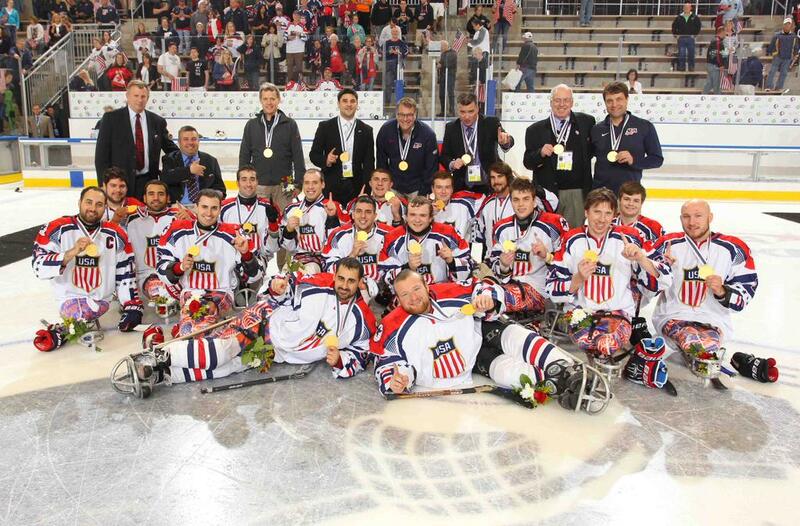 The U.S. National Sled Hockey Team, which includes four Marine Corps Veterans, claimed gold at the 2015 IPC Ice Sledge Hockey World Championships in Buffalo, New York on Sunday. The team earned its fourth consecutive shutout with a 3-0 victory over Canada. Team USA includes Marine Corps Veterans Luke McDermott, Josh Misiewicz, Paul Schaus and Josh Sweeney. The game remained scoreless through the first two periods of play when at 2 minutes, 58 seconds into the final frame Declan Farmer (Tampa, Fla.) slid a shot low on the short side past Canada’s goaltender to break the tie and give Team USA the only score needed for the win. Through the first two periods both teams played a physical game and traded scoring chances, but the U.S. controlled most of the play, outshooting Canada 13-3 through the first two stanzas. In the third period, Brody Roybal (Northlake, Ill.) fed Farmer a pass out of the right offensive corner and he scored low on the goaltender’s short side to give the U.S. the 1-0 lead. Less than five minutes later with Team USA continuing to press, Adam Page (Lancaster, N.Y.) found Dan McCoy (Cheswick, Pa.) waiting at the front of the net where he fired a shot over the goaltender for the second U.S. goal. Josh Pauls (Green Brook, N.J.) added an empty-net goal with :22 remaining for the 3-0 victory. Goaltender Steve Cash (Overland, Mo.) made eight saves to secure his fourth shutout in Team USA’s last six gold-medal games. With the victory, the U.S. National Sled Hockey Team has now won gold in three of the last four IPC Ice Sledge Hockey World Championships. Sunday’s victory also gave the United States its fifth championship in the last seven major international competitions, including the 2012 IPC Ice Sledge Hockey World Championships in Hamar, Norway; the 2012 World Sled Hockey Challenge in Calgary, Alberta; the 2014 Paralympic Winter Games in Sochi, Russia; and the 2015 World Sled Hockey Challenge in Leduc, Alberta. Congratulations and Semper Fi to the Marines of Team USA Hockey! Mike Molina is a public affairs specialist with VA’s Office of National Veterans Sports Programs and Special Events. He has been a federal public affairs practitioner for nearly 20 years, including serving as public affairs officer at the Jesse Brown VA in Chicago and the Montana VA Health Care System in Helena, Montana. Mike is a Marine Corps Veteran and was an amateur boxer on the All-Marine Boxing Team while stationed at Camp Lejeune, North Carolina.